I will call him squishy and he shall be mine and he shall be my squishy! Yay! That’s totally cute. 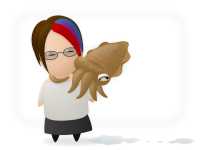 I love me some tentacles. This chibi gets the Calamari octo-hug seal of approval.